CLARKSDALE – In its 30-year history, the Sunflower River Blues Festival has grown from an informal, enthusiastic band of music lovers following the lead of Living Blues co-founder Jim O’Neal and Dr. Patricia Johnson into a premiere celebration with international status, says Melvita Tillis Presley, festival chair. USA Weekend ranked it among the Top Ten Places in America to hear authentic music, and State Tourism awarded the Sunflower with its own Blues Trail Marker for its excellence and longtime commitment to staging a free showcase for Mississippi’s blues heritage, continues Presley. “Through the years of accolades and high-powered headliners, the Sunflower has maintained its own signature: a distinctive, laid-back attitude of accessibility,” says Presley whose late father Melville Tillis, was longtime festival co-chairman. Owner of the Rivermount Lounge where Little Milton, Ike Turner, and Bobby Rush called home when they were in town and O.B. Buchana rehearsed and recorded in its basement, Tillis was a blues historian and also a role model for the Sunflower’s hospitable attitude, says John Sherman, former co-chairman. As chairman also of Clarksdale’s Public Service Commission for multiple terms, Tillis and Marvin Carraway, CPU general manager, traveled cross country visiting energy czars on business combined with extolling Clarksdale as the center of the blues universe. Apparently they were convincing, says Sherman, because several came to Clarksdale to see for themselves, and became major Sunflower Festival sponsors. 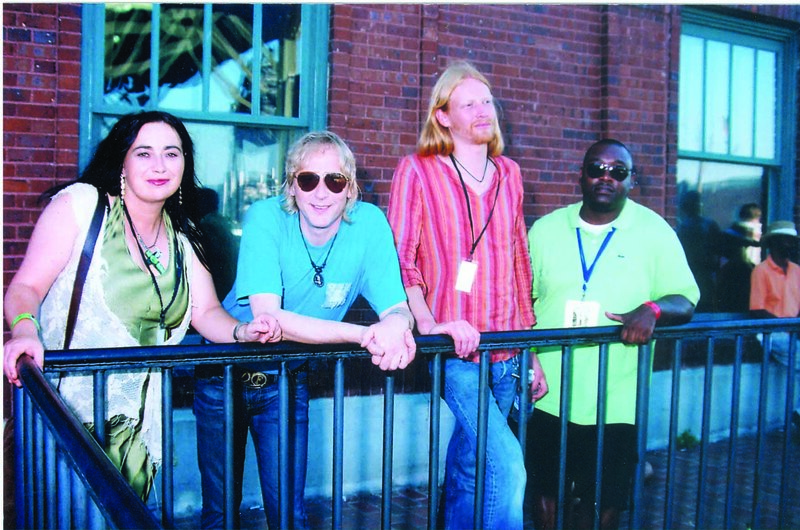 Others visitors have followed a similar path including Norwegians who forged a sister city and sister festival pact here in 1996 and are celebrating their own 30th Notodden Blues Festival Aug. 3-6. “Our sister city relationship with Clarksdale is very present in our anniversary festival,” says Jostein Forsberg, festival leader. He says Notodden’s 2017 festival - the largest in Europe - is featuring a Clarksdale Caravan of musicians including Super Chikan Johnson, Heather Crosse, Lee Williams, Anthony “Big A” Sherrod, and Christone “Kingfish” Ingram, and also a “Blues in Art” exhibition showcasing the works of area artists: Jason Bouldin, Cristen Craven Barnard, Stan Street, and Panny Mayfield. Visiting Clarksdale so often, he could probably register to vote, Forsberg and his band Spoonful of Blues with guitarist Morten Omlid, bassist Jens Haugen, and drummer Eskil Aasland have performed here numerous times. Equally at home on the Sunflower main stage are Margit Bakkin and Rita Engedalen, a Grammy Award winner/vocalist/songwriter. Engedalen has recorded at Gary Vincent’s studio with members of the Coahoma Community College Concert Choir and Myra Turner, Chapel Hill Baptist Church soloist and cousin of Ike Turner. “We bring some of our sponsors to Clarksdale every year to experience the birthplace of the blues; it’s wonderful to see how they get a deeper understanding for the blues and blues culture after having visited the place where it all began,” he continued. Blues Association members all agree the spiritual leader of the Sunflower Festival was Early Wright, the legendary “Soul Man” of WROX Radio and Mississippi’s first African American DJ. During four-hour shows each week night for more than 50 years, Early Wright interviewed musicians, played requests and broadcast local news, community and church announcements and admonitions. He and his wife, Ella, attended every Sunflower meeting until his health failed, and he died in 1999. In his honor Sunflower members inaugurated the festival’s highest individual recognition: The Early Wright Blues Heritage Award presented on the Saturday night main stage each year. An equally prestigious honor named for community activitist and Sunflower River Gospel Festival co-founder Julius Guy – the Julius Guy Gospel Heritage Award recognizes an outstanding individual’s contributions to gospel music. Among past festival chairmen and co-chairs who will be recognized from the main stage during the 30th Sunflower are Jim O’Neal, Howard Stovall, Steve Brandon, Bill Gresham, Nat McMullen, John Sherman, and Melvita Tillis Presley. Early Wright Award recipients include Early Wright, 1991; Skip Henderson, 1992; Sid Graves, 1993; Jim O’Neal, 1994; Panny Mayfield, 1995; Lillian S. McMurry, 1996; John Ruskey, 1997; Johnnie Billington and Howard Stovall, 1998; Lew Houston, 1999; Maie Smith, 2000; Yvonne Stanford, 2001; Doris and Sam Carr, 2002; Frank Ratliff and Sonny Payne, 2003; Catherine Clark, 2004; Nat McMullen, 2005. Red Paden, 2006; John Sherman, 2007; Steve Ladd, 2008; Dr. Frank & Rita Marascalco, 2009; Wade Fondren, 2010; Shelley Ritter, 2011; Morgan Freeman and Bill Luckett, 2012; Roger Stolle, 2013; Harold Pontez, 2014; Ginger Johnson-True Value Hardware/William H. Gresham, 2015; and Paul Wilson, 2016. Julius Guy Award recipients include: James Julius Guy, 1994; Rev. Uless Carter, 1995; Rev. Willie Morganfield, 1996; Melville Tillis, 1997; Johnny Kinnard, 1998; Kenneth Lackey, 1999; James Williams, 2000; Norman Collins, 2001; Rev. Lloyd Johnson, 2002; Edwin Fox, 2003; Nancy Forte, 2004; Dot Johnson, 2005; Rosie Williams, 2006. 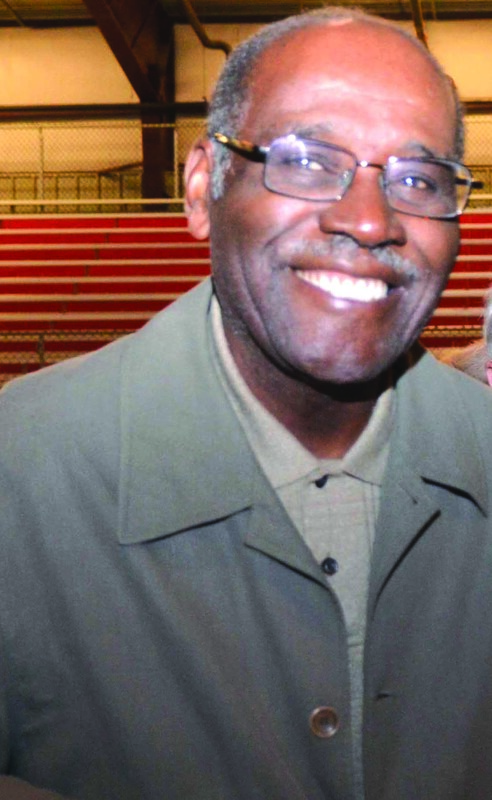 Nathaniel Johnson, 2007; Kelvin Towers, 2008; Christopher Coleman, 2009; C. V. Veal, 2010; Claudett Williams, 2011; Rev. Marvin K. Myles, 2012; Chapel Hill Men’s Chorus, 2013; Sons of Wonder, 2014; Myra Turner, Patrick “P.J.” Walker, 2015; and Terry Carr, 2016. For lineups, additional information about the Sunflower Festival’s 30th anniversary August 11-12-13, visit website: www.sunflowerfest.org, The Sunflower River Blues Association is a non-profit 501 c 3 organization staged entirely by volunteers. Admission to the three-day event is free. Tax-exempt donations are encouraged and welcomed. Information and forms about levels of support forms can be downloaded from the website. In early Sunflower days when the festival sometimes was staged on the loading docks of the freight depot before it became the Delta Blues Museum, members picked up cans and cleared away trash on the railroad tracks before the festival opened. Early members included (from left) Laura Cauthen, Phil Cauthen, James Butler, Maggie Monty, Pete Berry, Patty Johnson and Jim O’Neal (partially obscured), Dot Johnson, an unidentified member, and Howard Stovall. 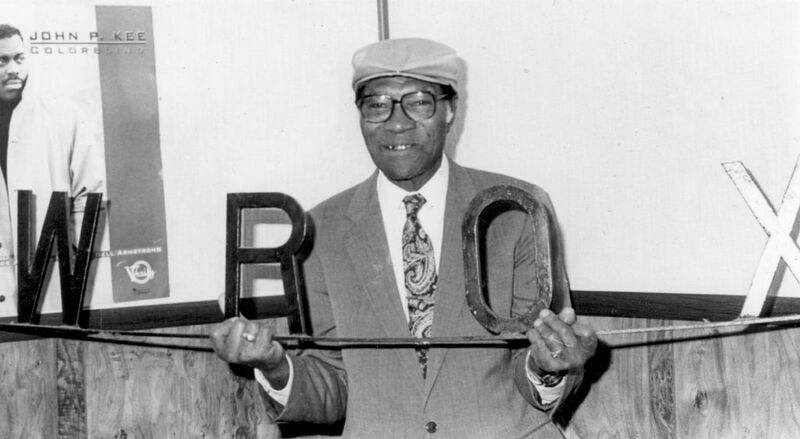 Early Wright, ‘The Soul Man’ and spiritual leader of the Sunflower River Blues and Gospel Festival holds a wrought iron WROX Radio sign outside his studio in the Alcazar Hotel. Among the Sunflower’s Norwegian ‘cousins’ from the Notodden Blues Festival in Scandinavia who have visited often and performed here are (standing backstage from left) Rita Engedalen, Jostein Forsberg, and Eskil Aasland. Among the dignitaries attending the 2012 unveiling of the Sunflower Festival’s Mississippi Blues Trail Marker are (from left) Mayor Henry Espy, Kappi Allen, Tourism director; Shelley Ritter, Delta Blues Museum director; Jim O’Neal, Sunflower co-founder; and Malcolm White, Mississippi Arts Commission director. 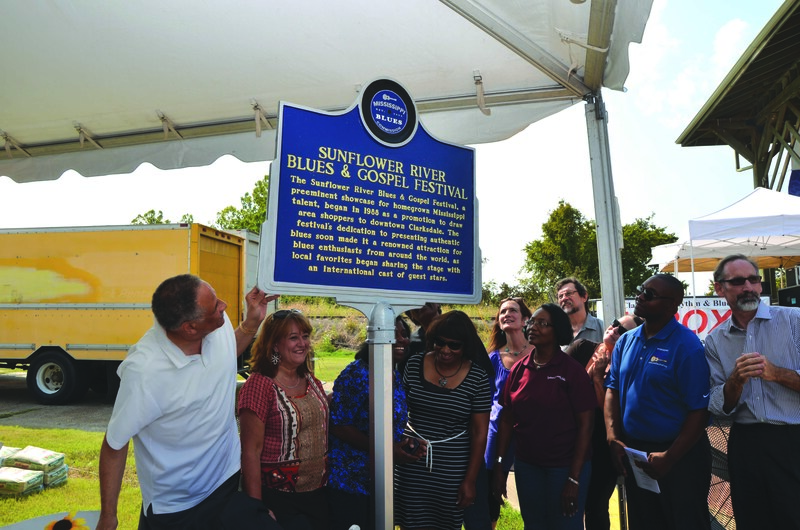 Blues historian and longtime Sunflower co-chairman Melville Tillis, was a role model for the festival’s distinctive signature of hospitality.